Dear Readers, we have a first time visitor to my blog today. Please join me in welcoming Elaine Jeremiah. Elaine, it is good to have you stop by More Agreeably Engaged, and I see you are accompanied by two of your characters, Cassie Taylor and Ted Hamilton. What do you have in store for my readers and me today? It must have something to do with your latest release, Love Without Time. I'm quite intrigued by the title and your guests, so I'll turn the floor over to you. Thank you, Janet, for kindly hosting me on your blog today! I’m going to share an interview with the two main characters from by book, ‘Love Without Time’. But first here’s a bit about me. I was l lucky enough to grow up in Hampshire, the same county as my favourite author Jane Austen. I’ve walked past the house in Winchester, Hampshire, where she died many times and even went to university in Winchester. I’ve visited her beautiful cottage at Chawton and Chawton House where her brother lived, which is now a library for early women’s writing. Very appropriate! I’ve always loved Jane Austen’s novels and the first one I read was ‘Pride and Prejudice’, when I was about 13. Jane Austen is a huge inspiration to me as an author. As well as being romantic, her novels are realistic. She understands people so well, how they think, act and respond to each other. Her characters and dialogue are believable and feel authentic. The stories are so good and the twists and turns in the plot really draw you in. If I could be even a tiny bit as good as her as an author, I’d be happy! Although I haven’t always written Jane Austen fan fiction, I can say that now I do I feel like I’ve finally found my niche. It feels natural to me. I decided to write a time travel story of a girl from the twenty-first century who finds herself accidentally walking into Regency England. I’ve enjoyed reading time travel stories related to Jane Austen, so thought I’d like to write my own. I hope if you get the chance to read ‘Love Without Time’, that you enjoy reading it as much as much as I enjoyed writing it. Me: Welcome, both of you. Thanks for joining me here today. Me: You don’t like it then? Cassie: (shakes her head) We’ve had enough of it. There’s no central heating, no indoor plumbing, no electricity. And the clothes. Don’t get me started on the corset! Ted: Yeah, no pressure or anything, Ms Author, but when on earth are you going to bring us back to the twenty-first century? Permanently? Me: (chuckles) Oh, you might get back at some stage. For now though I’m having too much fun with you guys being in Jane Austen’s England. Cassie: (glares) That’s easy for you to say. You’re not the one suffering here. You have no idea what you’re making us put up with. And I haven’t even met Jane Austen yet. Me: (holds hand up in mock surrender) OK, OK, I’ll see what I can do. Though it might be difficult. I’m sure she’s a very busy lady. Me: (clears throat) All right, all right. (pause) Isn’t there anything about Regency England that you like? Cassie: (eyes still on Ted) Well… OK, look I’ll admit that I wouldn’t have got with Ted if it hadn’t been for you sending me back in time to Regency England. Cassie: (shrugs) The clothes are very beautiful I suppose. And the buildings are too. Ted: There’s loads more countryside, fewer houses. Fewer people. Me: What about the Regency friends you’ve made? Ted: (shrugs) Can’t say I’ve made any. Me: Oh come on, Ted. You get on well with Fred and William, don’t you? Cassie: (looks between me and Ted) She’s got a point. Ted: Well, yeah, they’re OK I guess. But it’s not the same as being at home, with my twenty-first century friends and family. Me: Cassie? Haven’t you made any friends? Me: (smothers a laugh) OK, well thanks for giving me the low down on life in Regency England. Cassie: You still haven’t told us when we’re coming home! Me: I don’t know when, but all I can say is not yet. Ted: Is that it then? You’re not giving us any more info? Me: Nope. (smiles) You’ll just have to wait and see. Now I think it’s time for you both to head back there. Thanks for stopping by for the chat. Elaine lives in Bristol, South West England with her husband and their golden retriever, Dug. But she was privileged enough to grow up in Jane Austen country, in Hampshire. She’s always loved writing, but it’s only been in recent years that she’s been able to devote more time to it. She decided to self-publish with the help of her wonderful husband who’s very tech-savvy! In 2013 she self-published her first novel, but it’s only now with her fourth, her novel ‘Love Without Time’, that she feels she’s finally found her niche: Jane Austen Fan Fiction! She’s always loved Jane Austen’s writing and the Regency era, so this felt like a natural thing for her to do. 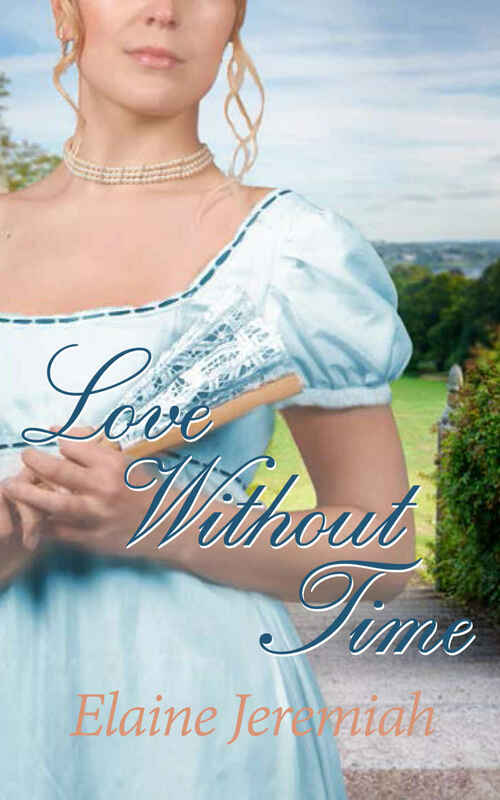 ‘Love Without Time’ is the first in a trilogy and it’s best described as a Jane Austen-inspired time travel romance. She’s currently hard at work on the second in the trilogy, ‘By Time Divided’. When Cassie Taylor meets an ordinary-looking man in a bookshop, the last thing she imagines is the encounter will lead to her time travelling to Regency England. Jane Austen-obsessed Cassie would love a romantic hero of her own to sweep her off her feet, but meeting Ted is seriously underwhelming. Then everything is turned upside down when Ted saves her life – and she nearly ends his. Guilt-ridden and panicked into saying she’s Ted’s girlfriend at the hospital, Cassie takes a walk outside at night, loses her way and finds herself in the past. She meets a young Regency woman, Isabella, who takes pity on her, allowing her to stay at the majestic Westerleigh Hall. But not everyone there trusts her and Cassie will find there are many pitfalls to be avoided if she’s to survive in this world. Can this be real? Is she dreaming? Will she ever get home? Thank you so much for visiting my blog, Elaine. It is great having you and your guests stop by. The interview was delightful and so is the synopsis. A special thanks to you, Cassie and Ted, for agreeing to come here today. I look forward to learning more about the two of you and your exciting experience! Time travel is such an intriguing topic. Author Elaine Jeremiah is giving away one eBook copy of her book, Love Without Time, to one lucky person. Leave a comment and share your thoughts about time travel and/or this book. Have any of you read it yet? I haven't but look forward to reading it soon. Be sure to leave me a way to contact you should you be the winner. The giveaway is international and will end at 11:59 P.M. Central Time on the 17th of February. Good luck to all. Thank you for stopping by, Brenda! Thank you also for the heads up on Elaine's first book. Congratulations on this book's release. It does sound good. Thank you for the opportunity to win a copy. Hi Patty. Thanks for stopping by. Good luck. Thank you all for your lovely comments. I had fun with the character interview. Love the interview! It is interesting that Cassie wants to return to her life rather than remaining in Regency England. It sounds romantic but I prefer my hygiene and convinces thank you for the giveaway. Thanks, Eva, for stopping by and sharing your thoughts. Good luck. I wouldn't want to stay there long either. I think it would soon lose its charms. Good luck in the giveaway Eva! I really like the sound of your book; this intrigues me. I do hope I am chosen. Thanks Christa! Hope you get to read it. Good luck in the giveaway. Don't think that would be a bad idea! Good luck in the giveaway. I think you're on to something there. Taking a survival kit sounds like a very good idea! Good luck in the giveaway. Thanks for sharing your thoughts on time travel. It is a fascinating topic, isn't it. Thank you! So glad you liked it. Good luck in the giveaway! Fun interview. My favorite line: "Ted: Yeah, no pressure or anything, Ms Author, but when on earth are you going to bring us back to the twenty-first century? Permanently?" Looking forward to more! Hi Janet and Elaine! Thanks for sharing this fun interview with us. I'm definitely with them on probably not wanting to stay in Regency England permanently! Too attached to the things they described in 21st century life. Although, as I live in Yorkshire, I don't live anywhere near Jane Austen's Hampshire, I have been lucky enough to visit a few times and walked along College Street in Winchester and trod the rooms and hallways of Jane Austen's House Museum and Chawton House Library. Now, as some folk who visit here may know, I'm a sci-fi geek as well as being a Janeite. So, anything that ties together my love of time travel and the works, life and times of my favourite author can't help but be a winner with me! For me, it's way past time for a certain Time Lord from Gallifrey to meet the vicar's daughter from Hampshire. I was hoping Peter Capaldi's Scottish take on The Doctor would exchange acerbic comments during his time in the TARDIS but sadly, that didn't happen. Maybe Jodie Wittaker's Yorkshire accented incarnation will have more luck. Hi Anji! It's great to see you here. I've missed seeing you lately. Yes, this story would work great for sci-fi lovers and Austenesque lovers. I think it sounds so neat! Thanks for dropping by and good luck. I'm with you. I'm not sure I would want to be in Regency England permanently. I might like to visit for a few weeks but I would miss some of the conveniences of our time period. Hi Anji! Thanks so much for your lovely comment, good to hear from you. I'm glad my book sounds like your kind of thing. Good luck in the giveaway. I think the experience of time travelling back to Regency era England is incredible and exciting. But I wouldn't want to give up my 21st century comfort and convenience to live there permanently. If there's a way to know how to time travel back and forth, I wouldn't mind spending a few days in Jane Austen's time. I'm so sorry I didn't respond sooner. Thank you for your comment. I would love to travel back too but like you I wouldn't want to stay long!